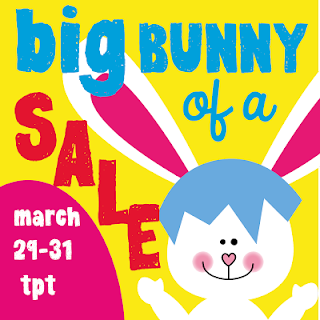 My TpT store is on SALE this Easter Weekend. You will find EVERTHING reduced at my store. Just click on the picture above to go to my store. Here's a cute little Monster Addition Table that I just posted. Students can use the worksheet to practice their Addition Facts as they are developing fluency with those facts. This free downloadable document can be found at my website. Just click on the picture above to go to my page with my free math and ela worksheets. Hopefully you'll also find a few more printables that you can use with your kids. Today, I'd like to share with you my FREE Numbers 0-10 Coloring Book with Ten-Frames. This printable coloring book is for young learners. Just download and print. Students will only need a few crayons to get started. The book has 12 pages - the cover and 11 number pages. Students will be learning number names, the count sequence plus much more while having fun. Just click on the picture above to go to my TpT store to get your free copy. I have another wonderful GIVEAWAY for you today. This one is hosted by Amy over at Happy Teacher Heaven. Amy is having a mega giveaway and is giving away 75 teaching resources!!! There are 4 different giveaways! Enter as many as you like. My donation is in Giveaway #3. My donation is my Spring Bunny Peeps Counting by 2s, 5s, and 10s to 120. It comes in both color and black and white. Click on the picture above to learn more about my product. Click on the top picture to go to Amy's blog to enter the giveaway. 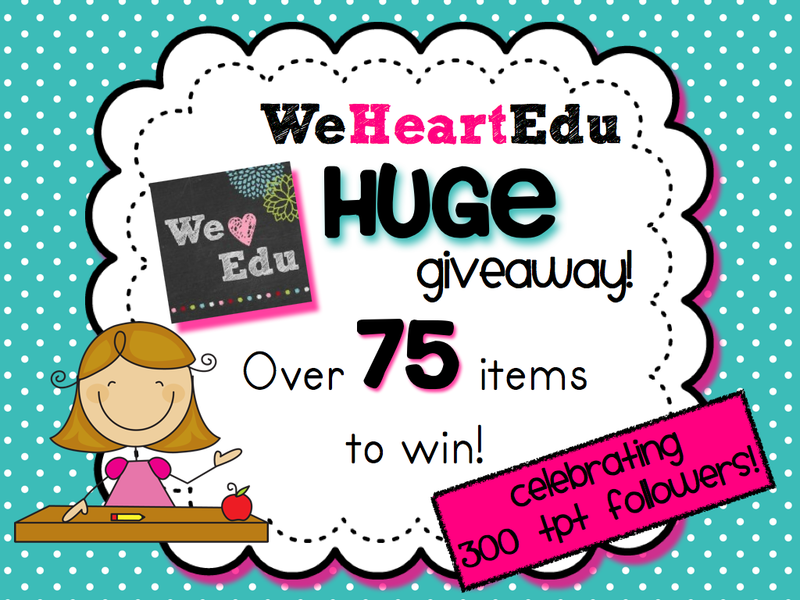 Michaela at We Heart Edu is having a wonderful GIVEAWAY with over 75 teaching products to win! There are 4 different Giveaways. Enter one or all 4. My donation is in GIVEAWAY # 3. It is my Bunnies-A-Go-Go Odd and Even Sorting Activity. Click on the picture above to learn about my product. Click on the top picture to go to Michaela's blog to enter the contest. Good Luck! I hope you win lots of great teaching resources. Do you need a few more activity ideas and resources to teach the kids about the Water Cycle? Here are a few that I use. Click on picture to read about this fun activity. Click on either picture to get these free downloads. Click on the picture of the book to read about this resource. Have fun with the Water Cycle! Sam from Mrs. Kelly's Klass is having a fun Spring Fever Linky Party!!! I know I'm ready for spring even though the weather here in New England is still winter! 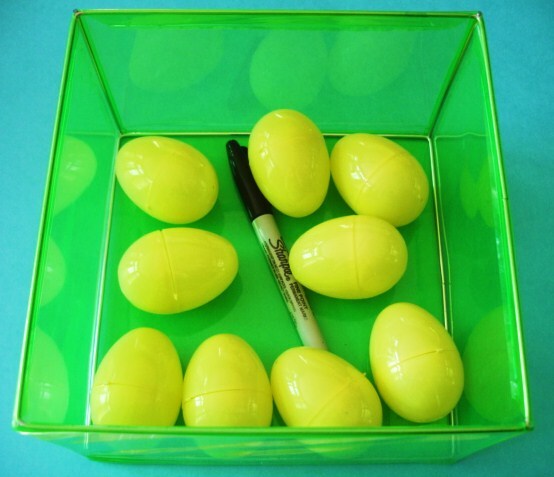 The Linky has LOTS of wonderful Spring Activities to do with your students. Both free and paid items can be linked up. So head over to Sam's blog to link up your Spring Activities, Lessons, etc. or stop by to download some great Springtime Fun. Just click on the picture above. Here is a freebie that I posted in my TpT store. Just click on either picture above to get the free download. WOW! It's almost spring and Easter is almost here! 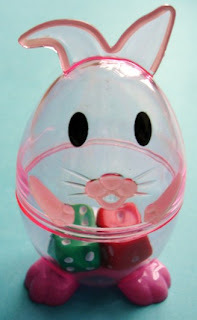 Here are some fun Bunny Egg Containers to use during math time to 'contain' the dice in your students' favorite math games that use dice. This package of 3 plastic bunny eggs was purchased at a Dollar Store. One or two dice fit inside easily and keep the dice contained and not rolling off the table or desk. 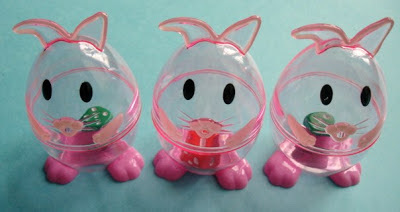 It's easy enough for kids to see inside the front of the bunny eggs to read the numbers (and even easier to read from the back)! 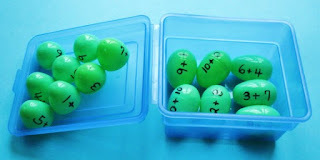 I have already posted 2 different fun math games that can be played with the dice. Just click on the links below to get directions for the games. Are you teaching Addition and working on Sums of Ten? Here's a fun Math Activity that helps children develop fluency with their very important math facts and math vocabulary (add, addition, addends, plus, sum). 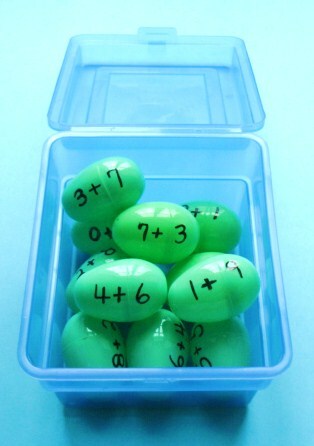 On one half of a plastic egg you will need to write one of the ADDENDS and the Plus Sign and on the other half of the egg you write the other ADDEND that will make the sum of ten when the two addends are combined. 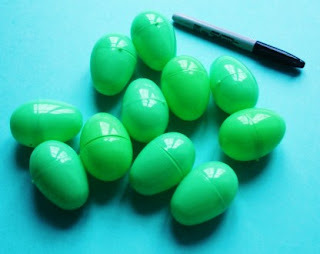 Next separate the two parts of the plastic eggs, mix them up, and let the kids put them back together making the correct Sums of Ten. 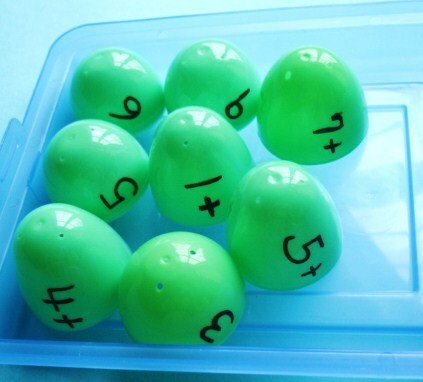 This set uses Sums of Ten but you could use the eggs to include any math facts that your students need to practice to develop math fluency. Younger students could work with Sums of 5, etc.